Copyright © 2018 Blu Room. 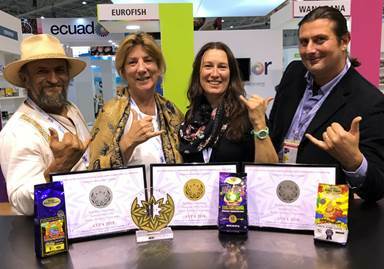 Premium Hawaiian Kona coffee Buddha’s Sanctuary LLC, with five farm single estate high mountain brands, earned the highest honors at the recent International Cupping Competition in Paris. The prestigious contest was hosted by The Agency for the Valorization of Agricultural Products (AVPA), a non-governmental, non-profit organization in Paris. Buddha’s Sanctuary beat out competitors from around the world. In the estate division, one first-place gold medal was awarded to Imagine 100% Kona Coffee while two second-place silver medals were recognized for Kona Gold and Buddha’s Cup estates. Buddha’s Sanctuary is a family owned and operated business located on Hawaii’s Big Island in the world-renowned Kona coffee district. Owner Christine Coleman built a Blu Room for her employee’s wellness program and then began experimenting with giving her coffee beans a Blu Room session. The winning coffee beans were infused in the Blu Room before roasting. The Blu Room is a patent-pending technology utilizing UV-B light, music and a unique octagon-shaped room to promote optimal healing and relaxation. Driven by the Barista movements and the intensive promotional campaigns by major brands, consumers are now willing to pay more for a cup of coffee. They also expect a rich gastronomic experience. Unlike specialty coffee events where all the attention is given to the Baristas, the AVPA distinguishes the roasters directly from their countries of origin. Cupping contests at the regional and international level have raised the standards for coffee production. Certifications and awards now grace package labels to help both retailers and consumers distinguish quality offerings. For the 2018 AVPA international competition in Paris, 117 entries were submitted by competitors from 25 countries all over the world on four continents – South America, Central America, Africa and Asia. There is still time to order Buddha’s Sanctuary coffee for the holidays at https://buddhascup.com/. Buddha’s Sanctuary offers coffee, tea, honey and a vacation retreat at their scenic location at Leleka’ae Waterfalls in the lush forests of Hilo. Blu Room is an internationally registered trade and service mark of JZ Knight. Used with permission. US Pat. No. 9,919,162.